The Turkish Land Forces ( ) is a branch of the Turkish Armed Forces. It is one of the largest standing armies in the world and the second largest army of NATO . While Turkish historians claim historical antecedents stretching back for millennia, the modern history of the Army began with its formation after the fall of the Ottoman Empire. Significant events since the foundation of the Army include combat in the Korean War and in the Cyprus Dispute, and acting as a NATO bulwark along Cold War frontiers through 1992. The Army holds the pre-eminent place within the Armed Forces. Alongside the other two armed services, it has frequently been involved in Turkish politics, which has now been regulated to an extent with the reform of the National Security Council. It is customary for the Chief of the Turkish General Staff to have been Army commander prior to his appointment as Turkey's senior ranking officer. The current Army commander is General Işık Koşaner. The modern Turkish Army has its foundations in remnants of the Ottoman forces inherited after the fall of the Ottoman Empire at the end of World War I, though official sources - the Commandership of Land Forces and others - date its founding to Mete Khan in 209 BC. The rise of Turkish nationalism in Anatolia , under the leadership of Mustafa Kemal Atatürk, led eventually to victory in the Turkish War of Independence, and subsequently to the founding of the Republic of Turkey , when these remnant forces were reorganized into the modern Turkish Army. The Turkish Army participated in the Korean War as a member state of the United Nations, suffering 731 deaths in combat out of the 5000 soldiers of the Turkish Brigade there, which fought at Kunu-ri and Kumyangjang-ni, and is credited with saving the U.S. 2nd Infantry Division from encirclement. After Turkey joined NATO on February 18, 1952, the government initiated a comprehensive modernization program for its Armed Forces. In July 1974, Turkey invaded Cyprus , following a coup organized by EOKA-B and led by Nikos Sampson who ousted the democratically elected Cypriot President Archbishop Makarios III in order to establish Enosis (Union) between Greece and Cyprus. The coup was backed by the Greek military junta in Athens. The Turkish invasion of Cyprus can be divided into two distinct Turkish offensives, the first being Attila 1, which commenced in the early hours of July 20, 1974, with an amphibious landing force forming a beachhead at Kyrenia 's Five Mile Beach (Pentemilli). This landing initially comprised only infantry troops, but was supported by rolling air and naval artillery attacks, and met with limited resistance from the Cyprus National Guard, which was in disarray as a result of the July 15, 1974 coup. The majority of fighting ceased on the 23rd of July, though sporadic clashes continued after this date until the 14th of August. Attila 1 successfully achieved its objective of forming a bridgehead with the Turkish Cypriot enclave of Agyrta-Nicosia. The second Turkish offensive began on August 14, 1974, as Greek and Turkish Cypriot representatives met in Geneva to discuss the situation on the island. Turkish pleas for international intervention having failed and very slow diplomatic progress, in addition to being confined to an undefensible and non-viable region in Cyprus, Turkish Armed forces took action again. Despite a UN ceasefire in place (several had already been disregarded), the Turkish Army, massively reinforced from weeks of build-up, launched an all-out surprise attack on ill-prepared Greek Cypriot and Greek units. 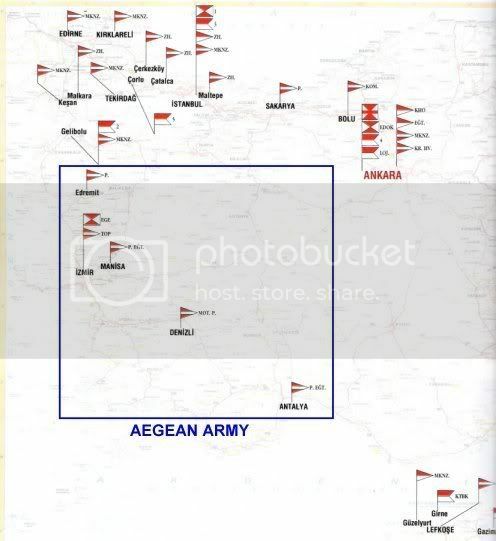 With little answer to the masses of armour, mechanised units, artillery and air support that the Turks could bring to bear, virtually all Greek Cypriot defences collapsed in a matter of days, and by August 16, 1974, Turkish forces, spearheaded by the 28th and 39th Infantry Divisions, had extended to capture some 37% of the island, including the towns of Gazimagusa , Varosha and Guzelyurt . The conflict in Cyprus resulted in the de-facto division of the island between the Turkish Cypriot controlled north and the Greek Cypriot controlled south . Turkey still maintains troops in Cyprus, since a political solution could not yet be achieved and since many members of the Turkish Cypriot community fear a return to the intercommunal violence which occurred between 1963 and 1974. According to official British military reports in 1974, the Turkish Army included the First Army (II, III, V, and XV Corps), Second Army (IV, VI, and VII Corps) and Third Army (VIII, IX, and XI Corps). There were also three Interior Zones with three recruit training divisions and four recruit training brigades. For a long period, these formations were grouped under the NATO headquarters LANDSOUTHEAST at Izmir , led by a Turkish Army four-star General. After the fall of the Soviet Union the headquarters became Joint Command Southeast for a period, before becoming Allied Air Component Command Izmir in 2004. In 1981/82, the Army had 1 armoured division, 2 mechanised infantry Divisions, and 14 Infantry Divisions, with 3000 M47 MBTs, 500 MBT M48 MBTs, as well as 70 Leopard 1A3 on order, for a total of 3570 tanks. Until the dissolution of the Warsaw Pact in 1990, the Army had a static defense mission of countering any possible attack on Thrace by Soviet and Warsaw Pact forces and any attack by the Soviet Transcaucasus Military District on the Caucasus frontier. The Third Army was responsible for holding the Caucasus line with about one third of the Army's total strength of one armoured, two mechanised, and fourteen infantry divisions (1986 data). When the General Staff attempted to shift 120,000 troops to the frontier with Iraq in 1990, they discovered, the writers of the U.S. Library of Congress Country Studies said, that there were serious deficiencies in the Army's ability to respond to crises that could erupt suddenly in distant regions. The Army was even less prepared for a situation requiring the deployment and logistical support of forces in operations beyond Turkey's borders. Towards the end of the 1980s, a restructuring and modernization process has been initiated by the Turkish Armed Forces, which still continues today. The final goal of Turkey is to produce indigenous military equipment and to become increasingly self-sufficient in terms of military technologies. Today, the Turkish Army officially claims it can deploy an Army Corps of 50,000 men to conduct joint operations at short notice, and also conduct air assault operations with a lift capability of up to 6 battalions at a time, day and night. At present, the primary main battle tanks of the Turkish Army are the Leopard 2A4 and the M60T. There are also around 400 Leopard 1 and 750 M60 Patton variants in service (excluding the M60T which were upgraded with the 120 mm MG253 guns), but the Turkish Army retains a large number of older vehicles. More than 2,800 M48 Pattons are still in service (upgraded with the 105 mm M68 guns) though only around 1,300 of these are stored as reserve MBTs, while the rest are mostly transformed into other types of military vehicles (such as cranes, MBT recovery vehicles and logistical support vehicles) or used as spare parts hulks. Turkey plans to build a total of 1,000 new MİTÜP Altay MBTs, in four separate batches of 250 units, with the MİTÜP Turkish National Tank Project. The tanks will be produced by the Turkish firm Otokar, and share some of the systems that are used in the K2 Black Panther main battle tank of South Korea . The Turkish Army has since the mid 1960s operated on a corps-division-brigade system, with a varying number of divisions and brigades assigned to a corps. The IISS Military Balance 1966-67 recorded a total strength of 360,000, with 16 infantry divisions (14 NATO assigned), 4 armoured brigades (Zırhlı tugay) with M47 Patton tanks, armoured cavalry regiments, and two parachute battalions. At some point in the 1960s the Army apparently utilised the Pentomic structure for a period, before adopting the American ROAD divisional organisation. Back in the early 1970s, there was a 6th Infantry Division based at Istanbul. From 1992 the Army began to change from a corps-division-regiment structure to a corps-brigade arrangement, with divisions remaining on Cyprus and for certain special other cases, such as for NATO's reaction forces. In accordance with NATO’s new strategy in the early 1990s, Turkey agreed to commit forces to NATO’s ACE Rapid Reaction Corps . 'Therefore, the decision was made to create a new division. Thus, the old 1 Inf Div which had been abolished many years ago was reactivated and renamed as 1 TU Mech Inf Div and attached to 4 TU Corps on 30 November 1993.’ This division was later disbanded, and appears to have been replaced within III Corps by the 52nd Armoured Division, formed later on. In late 2002 the III Corps, with its headquarters near Istanbul, was certified as one of the six NATO High Readiness Force-Land (HRF-L) headquarters and gained the additional title of the Rapidly Deployable Turkish Corps (RDTC). A year later, Jane's Defense Weekly reported on 9 July 2003 that as part of force restructuring, its four existing armies would be reorganized into a Western Army, in Istanbul, and the Eastern Army would replace 2nd Army in Malatya. This plan does not appear to have been carried out. 57th Artillery Training Brigade (Izmir ), 19th Infantry Brigade (Edremit), 11th Motorised Infantry Brigade (Denizli ), 3rd Infantry Training Brigade (Antalya ), 1st Infantry Training Brigade (Manisa). It is not fully clear whether the Turkish Cyprus Peace Force in Northern Cyprus was actually designated XI Corps. It appears that XV Corps, formerly in the First Army, has disbanded. The Commando brigades include the 1st Commando Brigade, Kayseri , 2nd Commando Brigade, Bolu , 3rd Commando Brigade, Midyat , and 4th Commando Brigade, Tunceli . http://www.kkk.tsk.mil.tr/GenelKonular/Tarihce/: "Kara Kuvvetleri temeli; Hun İmparatorluğu döneminde Mete Han tarafından M.Ö.209 yılında atılmıştır." Vlassis, 2004. All references for this paragraph and the one below are at Military operations during the Turkish invasion of Cyprus. Intercommunal Violence and Eric Solsten, ed. Cyprus: A Country Study. Washington: GPO for the Library of Congress, 1991. Armed Forces 1981/82 In: The Military Balance of the International Institut for Strategic Studies / London (Bernard & Graefe Verlag, Munich 1982.) and Ferdinand von Senger und Etterlin: Tanks of the World. Arms and Armor Press, London 1983. John Keegan & Andrew Wheatcroft, Zones of Conflict: An Atlas of Future Wars, Jonathan Cape, p.20-21. Unification of Culture and Tourism Ministries constitutional One soldier killed, three injured in terrorist attack Minister Cicek says Turkey's credit, Turkish Daily News, October 17, 2003. Turkish Order of Battle (partial) in 1996 and British Military Attache's Annual Report on the Turkish Army, Annex A to DA/48, dated 30 March 1974, FCO 9/2127, via Public Records Office, Kew.